Here at Apache, we have been specialising in Diesel jeans for twenty years, and they remain one of our biggest sellers each year. 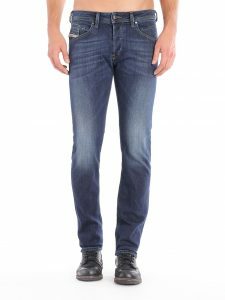 The legendary Italian brand are famous for producing exceptionally high quality jeans popular all across Europe, and indeed the world. The label’s unmistakable attitude shines through with every garment, often using texture-clashing fabrics and innovative treatments. Founder Renzo Rosso had the idea of creating denim with a slightly “used” look – an unusual approach in the 1970s when he started, but now very common in denim design. 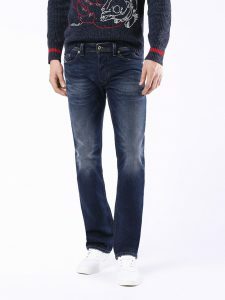 Rosso’s legacy rests on creating iconic jeans with innovate fabrics and washes, with a super-soft handle for that added comfort. We think that our hand-picked selection of the latest Diesel jeans, which you can explore below, deserve to rank alongside the best Diesel jeans throughout our long association with this classic brand. Most of our Diesel jeans go from 30 to 40 waist, including in-between sizes, with a choice of short, regular or long leg lengths. We are offering an exclusive 10% discount on Diesel jeans to all Apache customers, with the offer code “DIESEL16”. Note that we have various washes for each style shown. Check out our complete range of Diesel jeans here! 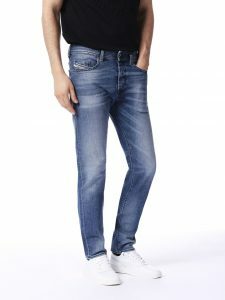 Diesel Belther jeans are crafted from stretch denim for premium comfort, making it ideal for the “sporty” gentleman with larger thighs who also wants a flattering slim leg that narrows to the ankle. Ideal for matching with a pair of trainers, Diesel describe the Belther as “a jean for every occasion”, coming in a vintage blue wash. Featuring a button fly, it boasts subtle tailoring details, such as gold pocket stitching, a “hidden” yoke, a loop coin pocket, and a Diesel-branded multi-shaped rivets. 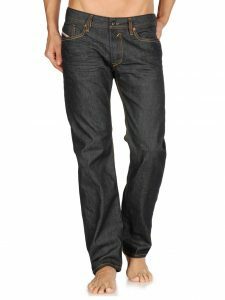 This Diesel Waykee jean is a clean, dark denim ideal for a “smarter” look, and is equally at home with a tailored casual shirt or blazer. It features a Raw even wash with no abrasions, rips or fading, and is slightly slimmer than the classic regular fit to complete that more modern tailored look. The clever use of an “arched” yoke creates an ergonomic approach by following the natural shape of your body for a slimming effect. The fabric is non-stretch, and it also features a button fly. As the saying goes, “if it ain’t broke, don’t fix it.” This Diesel Larkee is an enduringly popular jean that brings loyal customers back year after year for its reliable quality and traditional look. Crafted from stretch cotton, it boasts a Vintage blue wash with intentional fading around the usual stress points, and a subtle crease fading on the upper thighs and reverse of the knees. This Diesel Larkee is ideal for wearing with winter boots, as it is cut straight from knee to hem. Overall, it has a looser fit than our other featured jeans, appealing very much to the “athletic” gentleman. Like our other featured Diesel jeans it features a traditional 5 pocket design and button fly. This versatile Diesel Buster stands out from the crowd with its lightly washed finish and super-soft handle. It comes in a classic yet contemporary mid-rise tapered fit that goes brilliantly with a pair of trainers for that timeless look. The jean boasts a classic button fly and silver tonal rivets, and the top stitching is in khaki and navy. There’s a classic five pocket silhouette, and signature branding to the coin pocket and reverse waistband. We always welcome our customers to try our jeans in our Horsham shop, but if you’re shopping online we’ll always replace a jean for you if the sizing is slightly off. Use the code “DIESEL16” for a 10% discount!